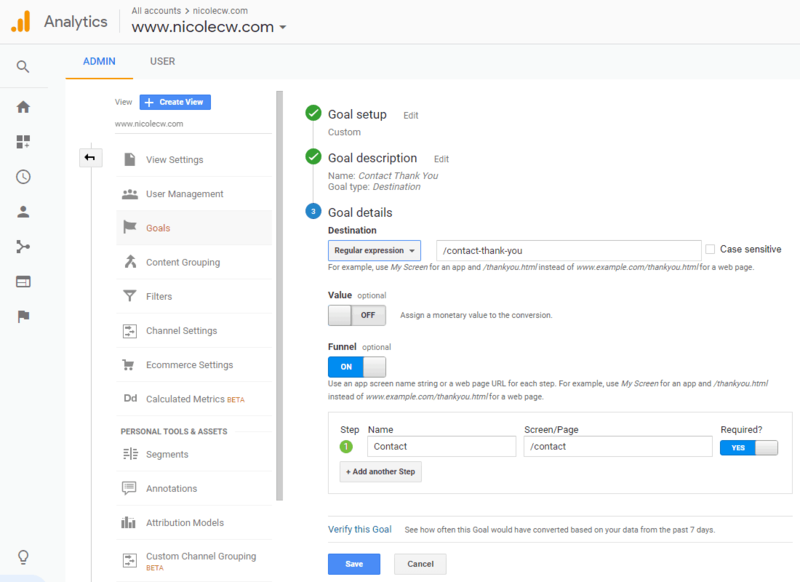 [Step-By-Step Guide] How To Set Up Google Analytics Goals For Your Business Website | Nicole C. W.
To grow your business, you need to set up business objectives. This could be anything from online purchases to newsletter signups. You should always translate these business objectives into actionable and measurable conversion goals in Google Analytics (GA). Only with these GA goals set up can you determine what works and what doesn’t. Today, I’ll discuss the various goals you can create and how to set them up in Google Analytics. Goals help you measure how often users complete specific actions. These specific actions are valuable to your business. Hence, this completed activity is also known as a conversion because it contributes to the success of your business. You can have goals like product purchases or newsletter signups. Defining goals is crucial to your business. If your goals are properly set up and configured, you will be able to gain valuable information like the number of conversions and conversion rate which will then help you evaluate the effectiveness of your business and marketing campaigns. Goals are tied to specific views. 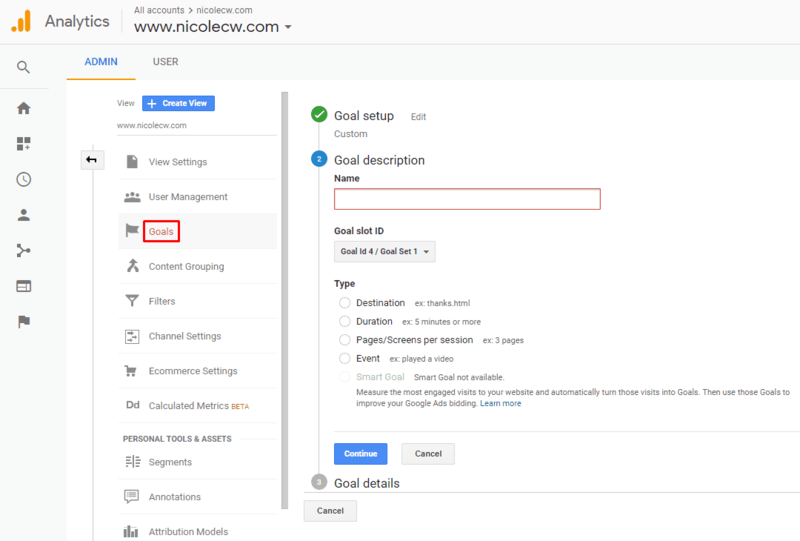 Meaning that if you create a goal in your all website data view, it isn’t automatically created in your www.nicolecw.com view. You will have to manually re-create them in the other GA views that you want. You can also state the monetary value for each goal (how much that conversion is worth to your business) or just leave it blank. 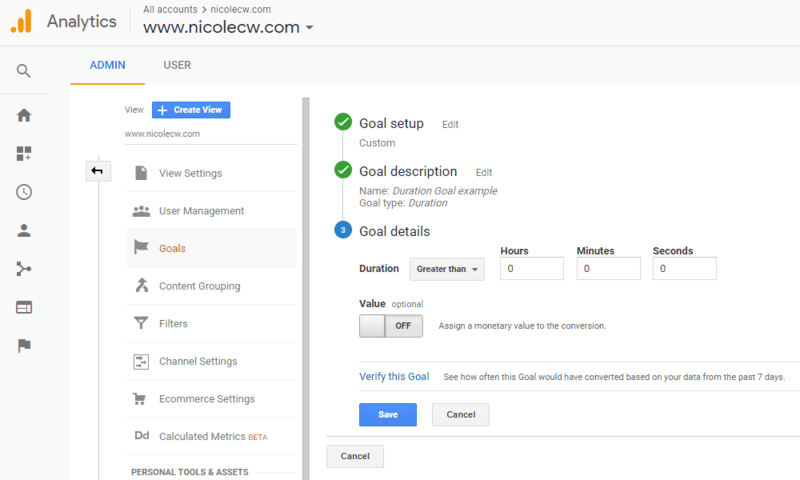 First, log into Google Analytics, click on Goals under your desired view then click on + New Goal. We’ll talk about smart goals later. But for now, you can choose between Template or Custom. I prefer Custom because I like to customize my goal setup. After you choose Custom, you can name your goal. Try to be as specific as possible. You want it short and sweet. Where you can tell at a glance what conversion this goal is tracking. Goal ID would be the goal number. By default, the first goal you create is goal 1, followed by goal 2 etc. Note that you can only create up to 20 goals per view. 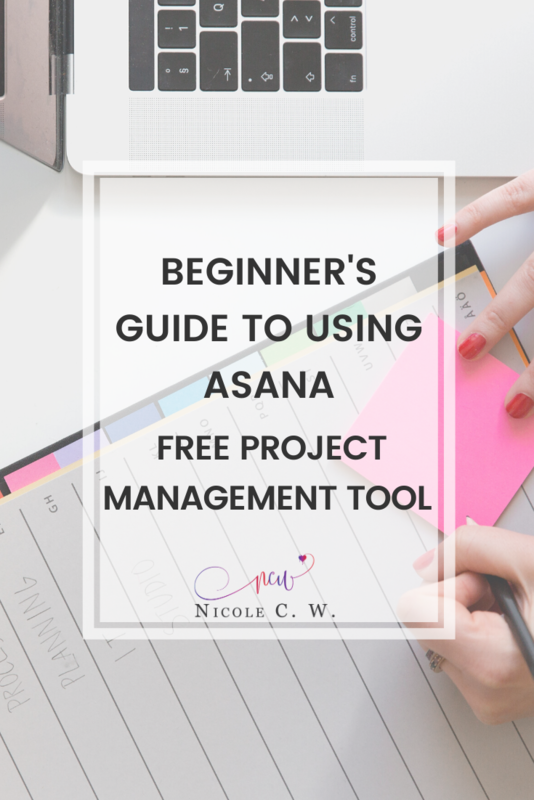 After which, you will either have to create another view for that property or edit an existing goal that is no longer used. Destination goals are mostly used to track conversions on thank you pages. 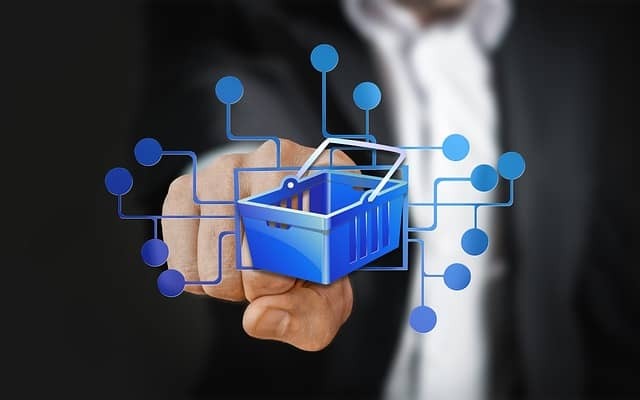 It could be a thank you page for buying a product or service, thank you page for signing up a newsletter or thank you page for contacting the business owner. You can also use destination goals to track conversions on any other pages that are important to you. Destination, as the name suggests, is where you state that important page’s URL. Bear in mind that this URL only includes the page. You don’t need to include the domain or subdomain. You can choose equals to, begins with or regular expression. I prefer regular expression because of its customizability (where I can make the goals precise or ambiguous). For instance, I can track conversions on /thank-you1 only or /thank-you1 to /thank-you9 in 1 goal (rather than creating 9 goals) using regular expression. Next, decide on whether you want this destination to be case sensitive. Only check this box if you want to match one of two identical URLs that differ by case (eg. /thank-you and /THANK-YOU). 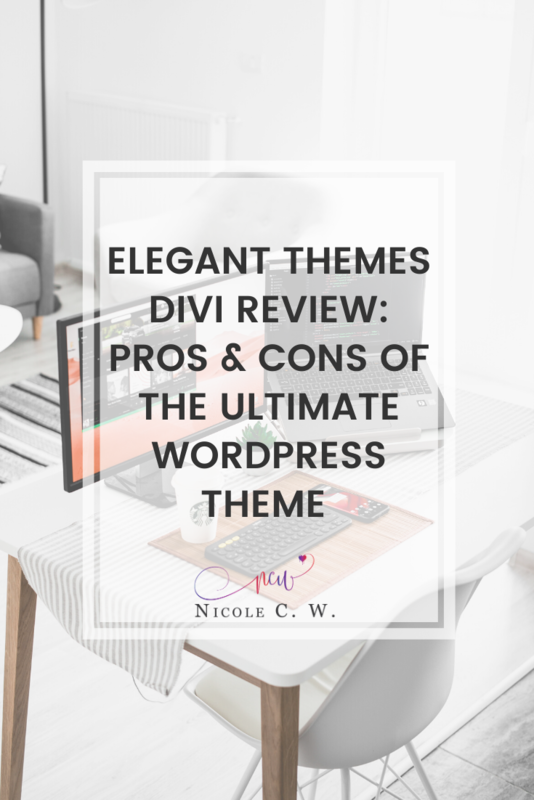 Also, it’s not advisable to have duplicate URLs because it might have a negative impact on your site’s search engine optimization. Goal value, as mentioned earlier, is optional. You can choose whether to assign a monetary value to the conversion. Goal funnel is also optional. But I highly recommend that you set this up if reaching this thank you page requires necessary visits to certain pages (eg. home page > contact us page > contact us thank you page). Again, only include the URL part after the domain. You can then verify this goal to see whether it’s working correctly. Note that there is an option to mark the 1st step of the funnel as required. This will affect the Funnel Visualization report in Google Analytics (where the report will only include conversions that pass through this required step). If you don’t set the 1st step as required, Google Analytics will also track people that enter the funnel midway. For example, if the home page (first step) is not required, your Funnel Visualization report will show visitors entering the funnel at contact us page. If engagement is important to you, you can create duration goals. This goal helps track how long visitors spend on your site. So if you’re a blogger or an entrepreneur where content marketing is a big focus in your business, you might want to consider creating duration goals. It’s very simple to set up. Just state the duration (number of hours, minutes and seconds) that you’ll like to track. For instance, if you create a duration goal of 1 hour, this goal is only completed if a session lasts longer than this specified amount of time. You can then set a value and verify the goal. Bear in mind that there is no filter for this goal. You cannot limit this duration goal to certain pages. In other words, you can get goal conversions if people spend more than 1 hour visiting all /products, /services and /contact pages. However, you can limit visits at the GA view level (eg. only include traffic to a certain subdomain). If you want to know how long people spend on each page, you can access the All Pages report and view the average time on page metric. (Behavior > Site Content > All Pages). Note that duration goal and average time on page are different. The first shows the number of sessions that lasts the amount of time you indicated while the latter shows the average amount of time users spent viewing a specified page. Again, this goal is suitable if you’re aiming to increase engagement. You can then track how many pages or screens visitors have loaded. 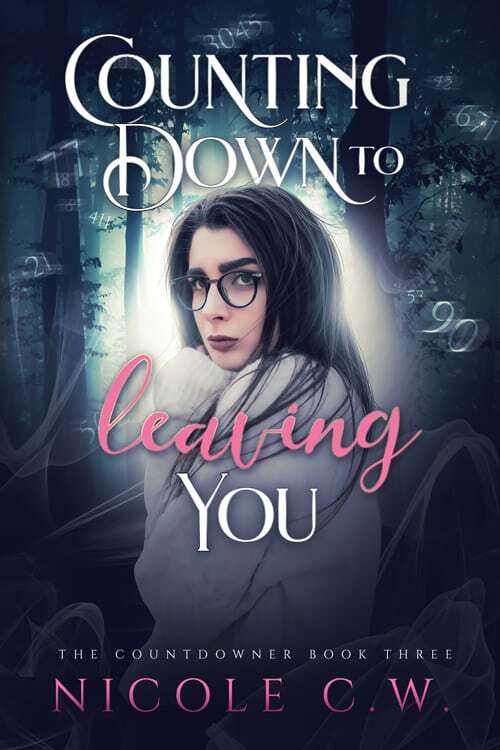 If your website visitors load many pages or screens while browsing your site, it might mean that they’re interested and are reading up more about your business. It could also mean that your content is so interesting that they’re reading one article after another. This is another easy setup. Just state the number of pages/screens per session that you’ll like to track. 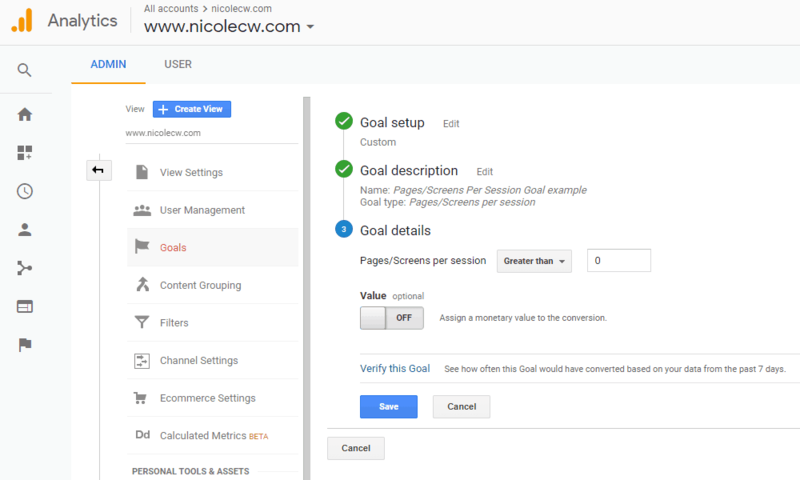 For example, you can create goal completions when users view greater than 5 pages/screens per session. Similarly, you can set a value and verify the goal. Note that there is no filter for this goal too. You can’t limit this goal to certain pages (like only counting visits to your product/service pages but not your blog articles). As mentioned earlier, you can however limit traffic at the GA view level (eg. only include traffic to a subdomain like blog.website.com). Another metric that is somewhat similar would be pages/session (Acquisition > All Traffic > Source/Medium) which tells you the average number of pages viewed during a session. On the other hand, pages/screens per session goal tells you the number of sessions where visitors view more than the number of pages/screens you indicated. Event goals would probably be another goal that you frequently create. They are completed when a specific action is fired on the page. 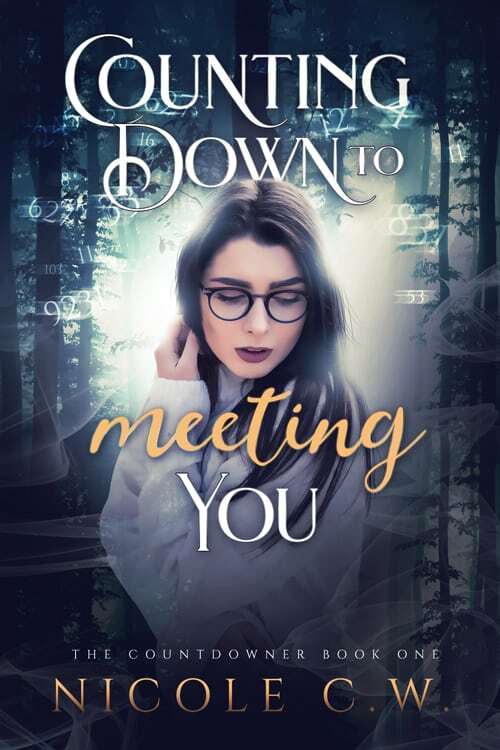 This could a button or link click such as clicks on call-to-action buttons, clicks to view YouTube videos and clicks on links to another website. I highly recommend that you set this up with Google Tag Manager. Some software, however, might have this built in already so you simply define the event category, action, label and value. 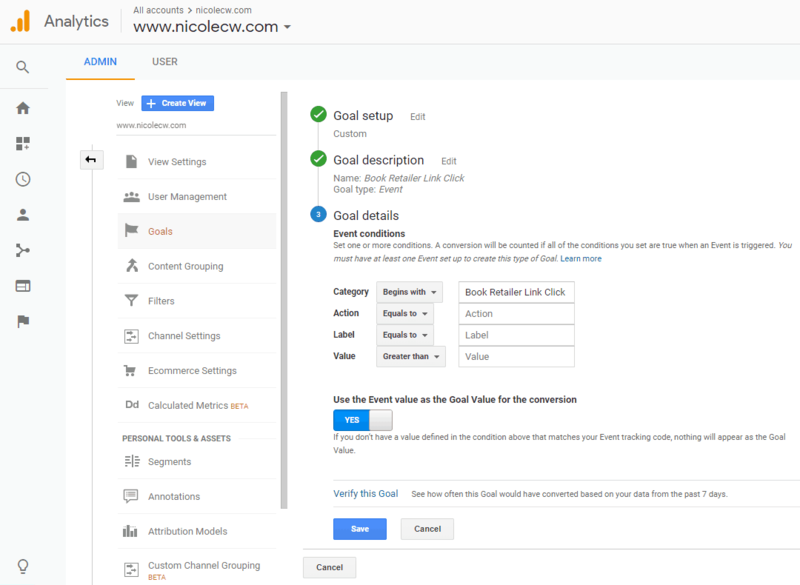 You have to tell Google Analytics exactly which event you’re referring to so it can track conversions for that specific event. For instance, if you’ve set up an event with event category ‘Downloads’ and event action ‘PDF’, just state it exactly as it is (with the spaces and title case). An event has 4 components. Remember these event components are not set in Google Analytics. They’re set in whatever software you use to create the events. In my case, I set up the events in Google Tag Manager. You will also have to option to use the event value as the goal value. For me, these 2 values are different. Event value is a number that is closely tied to the event while goal value is a monetary value of how much that conversion is worth to my business. Hence, just bear this difference in mind. I highly recommend that you verify the goal to check that it’s working correctly. Smart Goal measures the most engaged visits to your website and automatically turn these visits into goals. It uses machine learning to examine dozens of signals and determine which website sessions are most likely to result in conversions. In other words, Google chooses your best sessions and set them as conversions. You can then use these smart goals to optimize your Google AdWords performance. Now, return to the start of the goal creation. Instead of choosing Custom, choose Smart Goal. Since smart goals are not configurable or customizable, you don’t need to provide any information or alter any setting when creating. Let me emphasize once more, always test if your goal works. 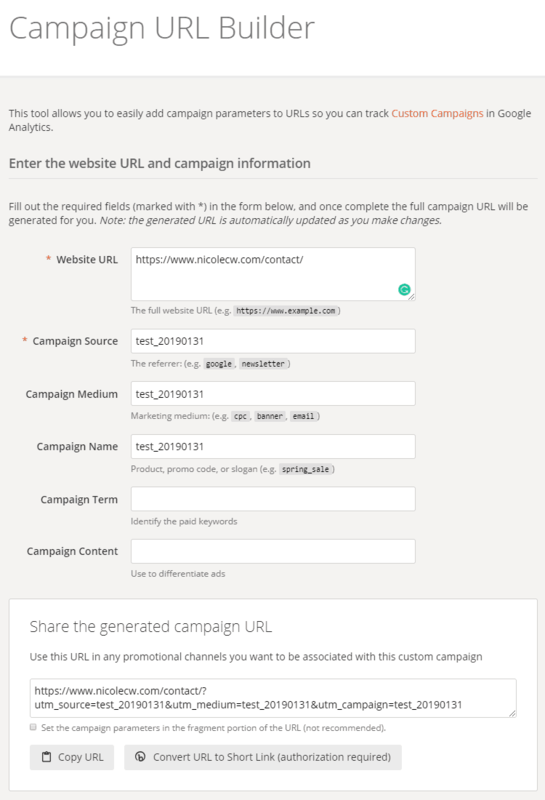 For example, I visit my website with campaign parameters of ‘test_20190131’. I can test if my destination goal is set up correctly by dropping a message to myself on the Contact page. 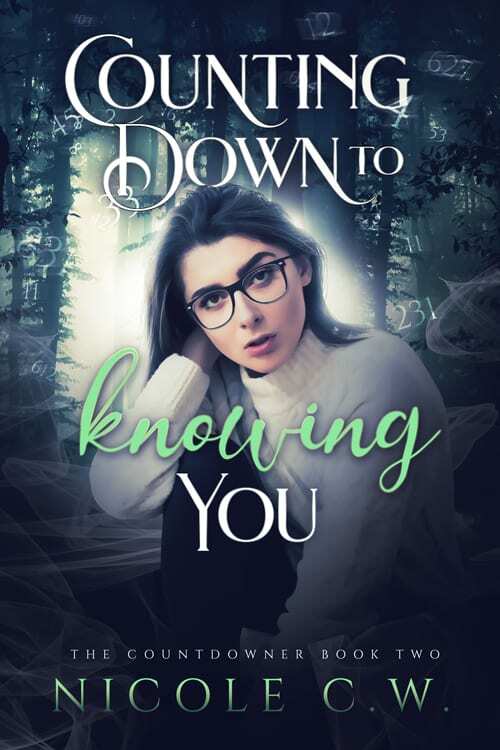 Or I can test whether the event goal is working by visiting my book page and clicking on the Amazon book retailer button. If there are goal completions, this means that the goals have been properly set up. Setting up duration, pages/screens per session and smart goals are pretty straightforward. It’s only duration and event goals that are much harder. But if you verify and test your goals, you should be able to get them to work correctly. Let’s grow our conversions in Google Analytics and be a step closer to success!